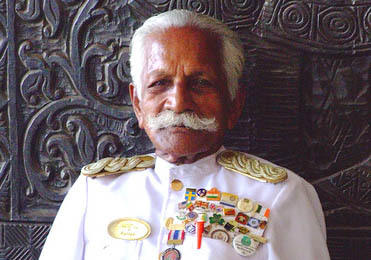 In 70 years of greeting guests to Sri Lankaâ€™s venerable Galle Face Hotel, doorman K. Chattu Kuttan has hobnobbed with everyone from royal heads of state to Bond girls and Soviet cosmonauts. Kuttan, who turns 90 on Monday, has watched the hotel change with the country, from colonial days, through independence and the dark decades of ethnic conflict. And he has pretty much seen it all, from a Japanese Zero fighter plane crash-landing on the hotel grounds during World War II, to sultry film star Ursula Andress dancing in the ballroom on New Yearâ€™s Eve 1976. Born in Indiaâ€™s Kerala province, Kuttan left his home and took the ferry to Sri Lankaâ€™s northern seaport town of Talaimannar and then made his way to Colombo in 1938. He worked as a servant for one of Colomboâ€™s elite families before landing a job at the hotel in 1942, weeks after the Japanese bombed the capital. He started as a waiter, and took 50 years to gravitate to the front door. â€œCeylon, as Sri Lankawas known, was a different country then. Famous people like Emperor Hirohito, Richard Nixon, Sir Laurence Olivier and George Bernard Shaw came and stayed with us,â€� Kuttan recalled.